The traditional research method of the perceived quality is to find the main factors affecting the perceived quality through questionnaire survey and factor analysis, and establish a product perception quality evaluation dimension for UCD. Innovation design can improve the perceived quality has been proved. Therefore, it is necessary to combine innovation method and demand evaluation method to the perceived quality to explore the better design process, and make a bridge between perceived quality evaluation method and innovation design. 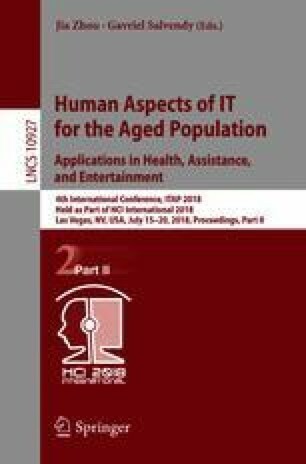 Results: In order to improve the perceived quality and user experience design of the health product for elderly, in this research, the perceived quality theory, innovation method and the demand analysis model are combined in the design process to improve the perceived quality. This method is proved to be feasible by the experiment. It will be used to design health products and services for the elderly, enhancing the user experience and alleviating the pressure of the aging society. Project Research on the Service Design of Old Health Products supported by Shanghai Summit Discipline in Design (DB17025). This study is supported by key curriculum projects in Shanghai (YZ0126121). This study is supported by the Humanities and Social Sciences Fund of the Ministry of Education (Z110-B-1701).